Gobsmacked combines the northern English and Scottish slang term gob, mouth, with the verb smack. It suggests the speaker is utterly astonished or astounded. It’s much stronger than just being surprised; it’s used for something that leaves you speechless, or otherwise stops you dead in your tracks. It suggests that something is as surprising as being suddenly hit in the face. 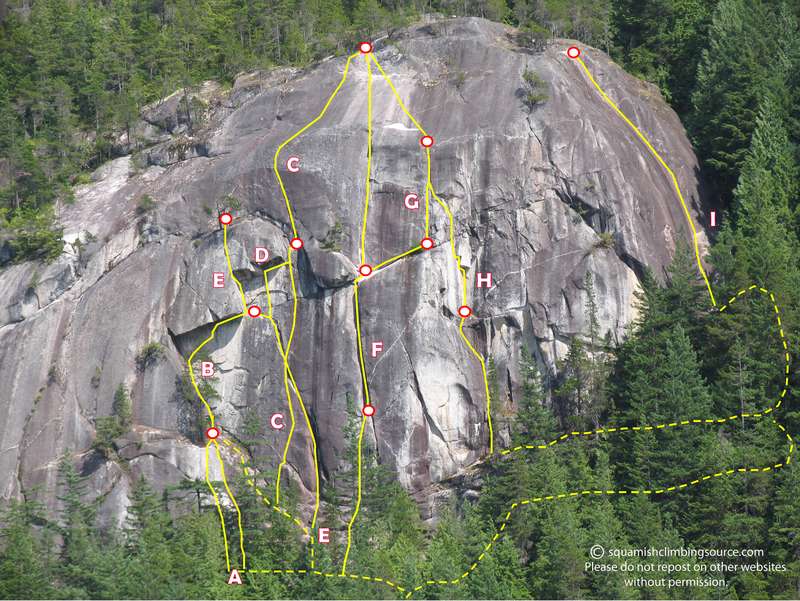 Gobsmacking Wall is the southerly extension of the Shannon Falls area. This cliff couldn’t be any more different than the northerly sector. Located beyond the beautiful and open slabs defined by the black tongue of Magic Carpet Ride. Like a cresting wave, the cliff quickly curls up to form and abrupt vertical face. Square cut overhangs and white, gold streaked stone indicative of steep granite, give an aesthetic and intimidating air to the cliff. Despite Hungry Wolf and Man of Leisure being modestly popular classics, most of the climbing on this wall has sat dormant for years. The full potential of this wall is now being realized with several, excellent new lines and the refurbishing of long neglected routes. A. Name Unknown, 5.10b, 20m. Two, side by side corner cracks. Both steeper and better than they appear. The left corner is fingers to hands size, the right hands to fist plus. These make for a good first pitch to Monkey Lust. B. Monkey Lust, 5.10d, 25m. Put up in ’79, this route marked the start of freeclimbing development on this wall. Access by route A. or via 3rd class ramp. Climb up main corner until it is possible to face climb up and right under the roof, crux comes traversing right towards the end of the roof, an excellent, atmospheric route. C. Sacrificial Lamb, 5.11a, 2 pitches. Access via 3rd class ramp. 5.11a. An excellent, continuous fingercrack. Tricky start (purple metolius), leads to a cruxy span. Continue straight up locking fingers splitter. 5.10c. Thin cracks fused into bizarre dyke feature, crux move transitioning onto the slab. 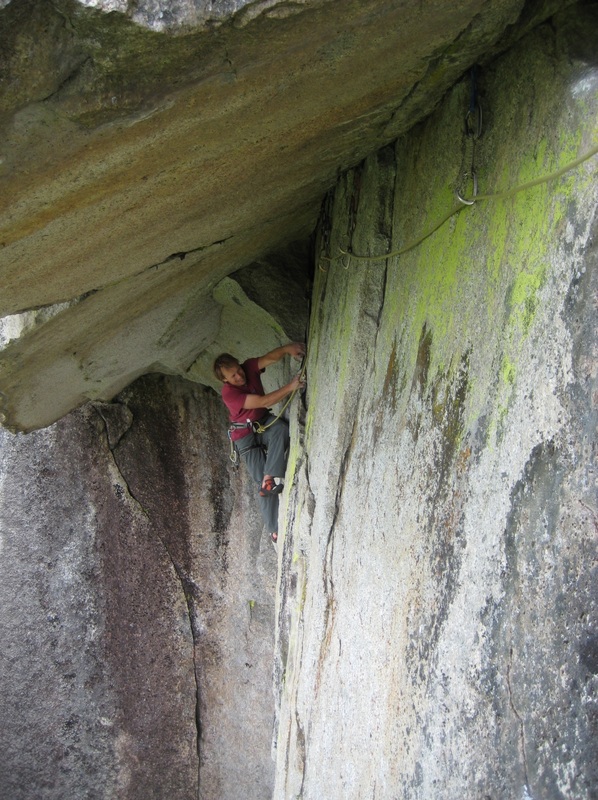 D. Hungry Ike, 5.11b, 32m. Start on Sacrificial Lamb, after crux of SL follow left leaning crack to an exciting technical crux past an overlap, finish by underclinging right to the anchor of SL. E. Cross-Eyed, 5.10c, 38m. This long, spectacular pitch is highly recommended. 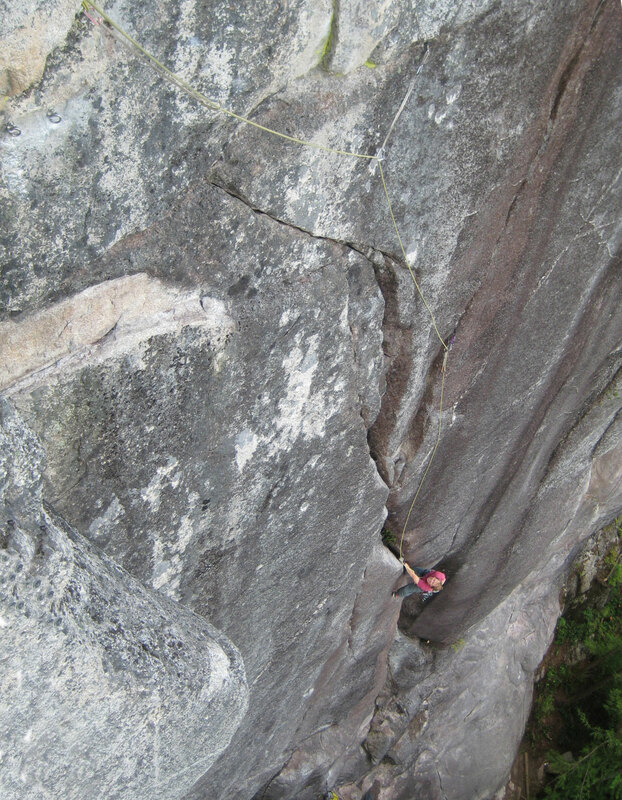 Starts in the left leaning chimney feature, the crux comes exiting the chimney. 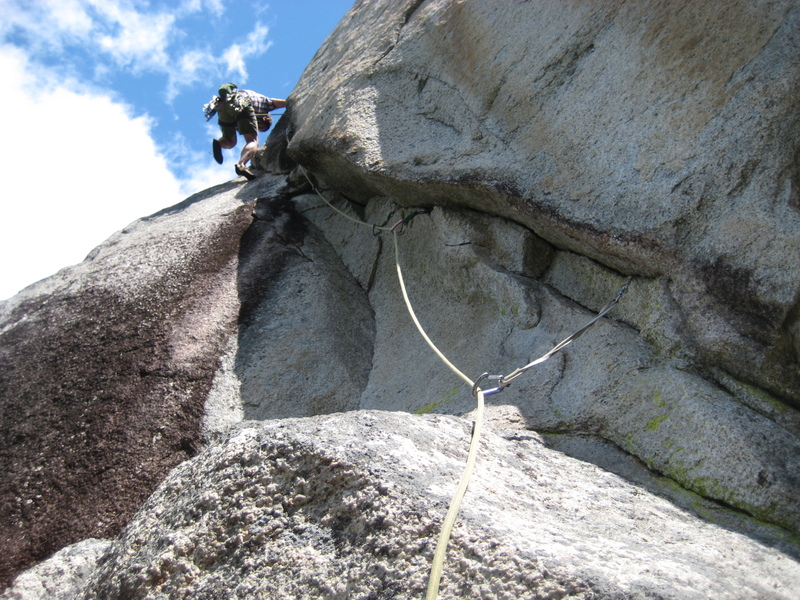 Cross Sacrificial Lamb and continue left past Monkey Lust anchor and over 2 meter roof to belay on “Dristan Ledge”. This roof is the original 2nd pitch of Monkey Lust but climbing via Cross Eyed allows it to be climbed in one big pitch. F. Chewbacca’s, 5.10b, 3 pitches. Classic. The most obvious line on the wall, originally a bushy 1973 aid line named Snot. The modern version is spotless clean, steep, and varied. 5.10a. Easy face climbing leads to the base of triple crack system. Thin hands jamming up the lefthand crack is harder than it looks, belay at the base of the chimney. 5.9. Friendly and fun chimney climbing to “Tremendous Ledge”. 5.10b. Straight up lovely vertical cracks, staying left to enter blank corner past a bolt, easy slab to the top of the cliff. G. Hunter’s Moon, pitch 2, 5.10a. This finger crack makes for a great alternate third pitch to Chewbacca’s. I. Styrofoam Window, 5.10b, 45m. Sustained, technical left facing corner. 5 bolts plus a few small cams. Alternate start to the left skips one bolt and uses a couple more cams from 0.5″ to 0.75″. Getting established under the roof on Monkey Lust, 5.10d. We did Chewbacca’s today. Pretty burly 10.b as far as Squamish is concerned. I had left small cams (unknowingly) at p2 belay and scared the crap out of myself further up, at what I assume is the crux finish. Pretty stout 5.9. I lossed the “friendly and fun part ” about 30ft up, and had a rats nest of mank protecting the exit (shallow, and some were between rather thin looking flakes). Anyway my fault. Otherwise I had a blast! Question on p1 are most people going left? We did.